Consider moving your party onsite or to a community hall . This will save you thousands in venue fees, and can do the following to save money while creating good will. The tips below will work in any venue, but will allow you to either utilize your own location, or downgrade to a less expensive venue while maintaining or improving the ambiance over last year. Use lighting and draping . It is astounding what lighting and draping can do to completely transform a space. By draping your cubicles and utilizing any empty ones as appetizer stations or caricature drawing booths or chair massage spaces, you will give your employees a completely different perspective on their office! If you do decide to utilize a hotel ballroom, lighting will also transform a boxy space into a magical environment, for just a few thousand dollars. Have an economical showdown with an employee holiday decorating contest . If you are having your holiday party onsite, think about offering a generous gift to the team of employees who makes the best holiday décor, but make sure it is all on the same theme, with specific color pallets to keep the integrity of the event. The gift can be days off, if business is a little slow, or cash prizes or gift certificates. This activity both builds team spirit and saves you the thousands a prop company would charge. Go for heavy appetizers . By offering a lounge style event instead of a formal sit down dinner, either onsite or off site, you both save a LOT of money: $10 to $20 per person on rentals for flatware, china, glassware, linens, etc. and also reduce the wait staff. Instead of fully dressed large tables with staff to bus and clean all of the china on the tables, you can offer very nice appetizers, and lots of them. By doing so, you can make all of them finger foods that require only a napkin or at most a small plate that can be either disposable or china. This will drastically reduce the staff needed for bussing and set up, and will allow you to have your event in almost ANY office environment as well as a lot of less expensive venues. If you do not have large ancillary rooms such as a cafeteria in your complex, then by utilizing appetizer stations, you can make use of your existing spaces. Just remember, do not skimp on lighting and décor. 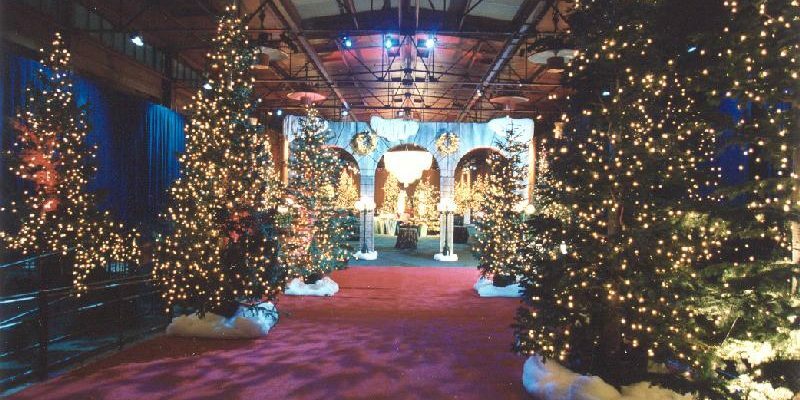 That is what will transform your office place into a winter holiday wonderland!